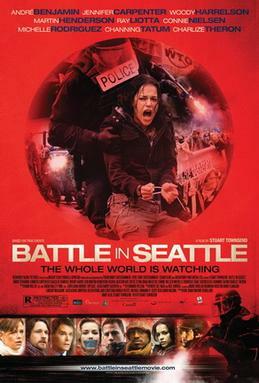 Battle in Seattle (2008) is a 2007 political action-thriller film written and directed by Stuart Townsend, in his directorial debut. The story is based on the protest activity at the WTO Ministerial Conference of 1999. The film premiered on May 22, 2008 at the Seattle International Film Festival. The film depicts the protest in 1999, as thousands of activists arrive in Seattle, Washington in masses to protest the WTO Ministerial Conference of 1999. Protesters believe the World Trade Organization contributes to widening the wealth gap between the rich and the poor, while the WTO claims to be fixing the disparity and decreasing world hunger, disease, and death. The movie takes an in-depth look at several fictional characters during those five days in 1999 as demonstrators protested the meeting of the WTO in Seattle’s streets. The movie portrays conflicts between the peaceful protesters and people committing property destruction whose actions were widely covered by the media. Although the protest began peacefully with a goal of stopping the WTO talks, police began teargassing the crowd after it refused to clear the streets and the situation escalated into a full-scale riot and a State of Emergency that pitted protesters against the Seattle Police Department and the Washington National Guard.